I want to start by saying I know this is kind of crazy and doesn't sound like it's even supported. It also probably leaves you wondering why would anyone do this? Well the situation was interesting and the quick answer is normally you wouldn't. That said, I recently had a customer who had a VNX unified and they were re-purposing the unit for something other than what they originally bought it for. That new use case had no need for the unified components, which also consumed about four additional rack units. The rack units mattered in this case because the device is in a colocation and space costs lots of money. I figured we should start by looking at what makes up a Unified VNX 5300, the model that I worked with. 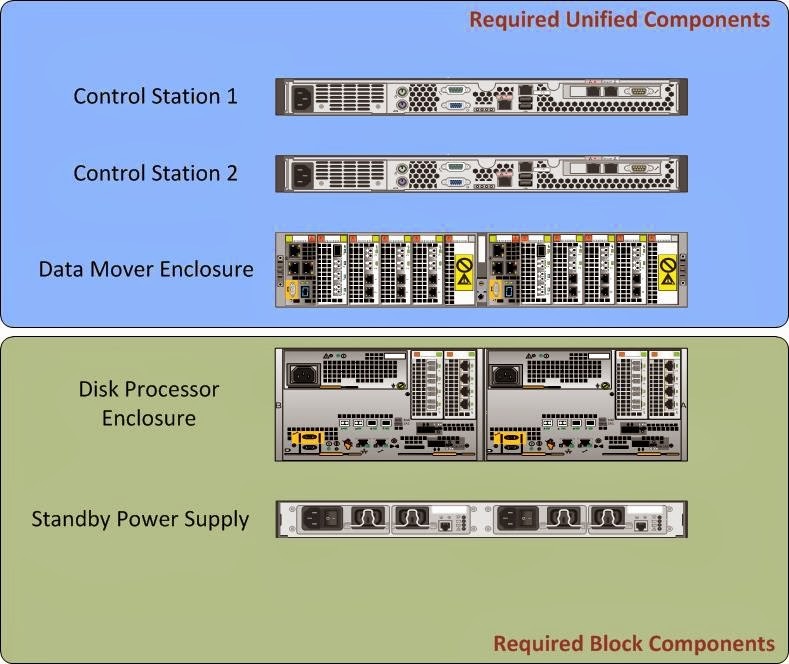 Below is an image that outlines the base components involved with a VNX 5300. Basically what we were looking to do was to remove all the components in the blue box. The control stations and DME take up four rack units, and also consume additional PDU outlets. The problem is if we just unplug these devices Unisphere will alert us that the Data Movers are down and the control stations are unreachable. Also with a VNX unified we have additional option that aren't required for block functionality. Bottom line is just unplugging the components would not be feasible. Now lets get into the process I used to solve this issue. First I knew that if we wanted to get the array to come up as block only we were going to have to reset the device back to factory defaults. This was really the main process to getting the unified parts removed. The process for re-imaging a VNX is documented and typically used when you have had some sort of problem with configuration coming from the factory. It is technically a field service task that can be done. Several of our engineers have had to do this before, which is how I got the idea to do it in the first place. If you can't get the instructions or required files for re-imaging you probably should contact your EMC Service provider (hopefully Focus) and get some help. The key to remember with the re-imaging is to disconnect your DME and CS1/CS2 before doing the re-image. This way when the re-image is complete it'll never know the Unified parts were there. After your re-image is done you'll have to run the unisphere storage system initialization utility to basically perform the initial install as if it was a new array, because it thinks it is! After your initialization you'll likely have to update the OE to latest version. Also beware that when you do this you'll need to have all of your enablers on hand because the re-image wipes those out, so they'll need to be re-installed. That's pretty much it for the hard stuff. You'll still have to setup your cache and storage groups but you're basically at square one. One other big deal here, especially if you're trying to save rack space like I was, you'll need to order replacement rails for the DPE and SPS. The reason for this is on a unified the main systems components have an integrated rail system that doesn't break into pieces.